Adipose tissue is no longer viewed as an inert energy storage organ, but is emerging as an active participant in regulating physiological and pathologic processes. Many soluble factors have been identified from the adipose tissue and are so called as adipocytokines or adipokines. Some of the adipokines are mainly produced by the adipose tisse like leptin and resistin, while others are also synthesized in other tissues like TNF-alpha, IL-6, MCP-1, and IL-1. 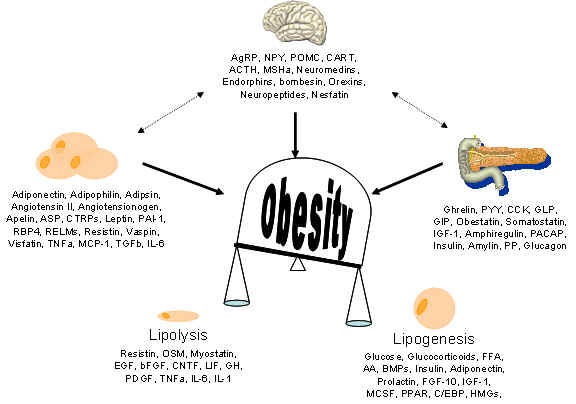 Because all of these factors can act in an autocrine , paracrine or endocrine manner in the organisms, adipokines are thought to serve as mediators linking obesity, metabolic syndrome, diabetes, inflammation, immunity and other obesity-related diseases. As the protein array pioneer company, RayBiotech provides the most comprehensive cytokine antibody array products in today's market. Using our patent pending technology, researchers can rapidly and accurately measure the expression levels of 62 different adipokines from a single sample semi-quantitatively. The technology is designed based on the sandwich immunoassay principle. A panel of antibodies is immobilized in specific spot locations on the surface of membrane or a glass chip. Incubation of array membranes with biological samples results in the capture of adipokines by corresponding antibodies. The bound proteins are then detected with a cocktail of biotinylated antibodies. 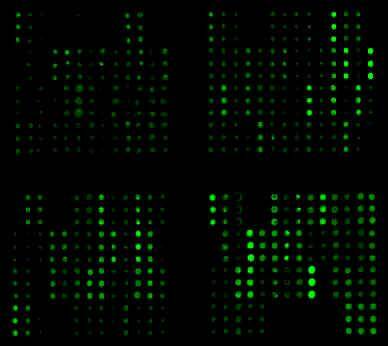 Finally, signals are visualized using chemiluminescence, colorimetry or fluorescence. Click for further information on all antibody array products. Recent technological advances by RayBiotech have enabled the largest commercially available antibody array to date. With the L Series Antibody Array, researchers can now obtain a broad, panoramic view of cytokine expression. The expression levels of 182 human adipokines can be simultaneously detected in cell culture supernates or serum. Furthermore, an internal control is used to monitor the whole process including biotin-labeling, so this high density array will accurately reflect available adipokines in your sample.